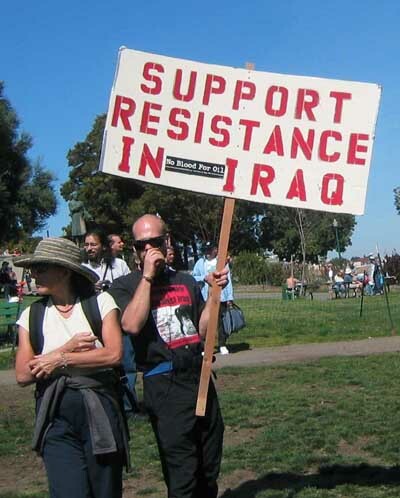 Today, we have some fine folks who support the terrorists that are killing U.S. troops and Iraqi Civilians. The "Resistance" is little more than suicide bombings against unarmed civilians and cowardly roadside bombings against U.S. troops. If a picture is worth a thousand words, then this one is saying "dumb @$$" 500 times! Scary, scary stuff. But mostly pathetic, don't you think? Yeah, pretty damn pathetic. Is this Frank H? I am a graduate of West Point currently serving as a Captain in the U.S. Army Infantry. I have served two combat tours with the 82nd Airborne Division, one each in Afghanistan and Iraq. While I served in the Global War on Terror, the actions and statements of my leadership led me to believe that United States policy did not require application of the Geneva Conventions in Afghanistan or Iraq. On 7 May 2004, Secretary of Defense Rumsfeld's testimony that the United States followed the Geneva Conventions in Iraq and the "spirit" of the Geneva Conventions in Afghanistan prompted me to begin an approach for clarification. For 17 months, I tried to determine what specific standards governed the treatment of detainees by consulting my chain of command through battalion commander, multiple JAG lawyers, multiple Democrat and Republican Congressmen and their aides, the Ft. Bragg Inspector General's office, multiple government reports, the Secretary of the Army and multiple general officers, a professional interrogator at Guantanamo Bay, the deputy head of the department at West Point responsible for teaching Just War Theory and Law of Land Warfare, and numerous peers who I regard as honorable and intelligent men. Instead of resolving my concerns, the approach for clarification process leaves me deeply troubled. Despite my efforts, I have been unable to get clear, consistent answers from my leadership about what constitutes lawful and humane treatment of detainees. I am certain that this confusion contributed to a wide range of abuses including death threats, beatings, broken bones, murder, exposure to elements, extreme forced physical exertion, hostage-taking, stripping, sleep deprivation and degrading treatment. I and troops under my command witnessed some of these abuses in both Afghanistan and Iraq. This is a tragedy. I can remember, as a cadet at West Point, resolving to ensure that my men would never commit a dishonorable act; that I would protect them from that type of burden. It absolutely breaks my heart that I have failed some of them in this regard. That is in the past and there is nothing we can do about it now. But, we can learn from our mistakes and ensure that this does not happen again. Take a major step in that direction; eliminate the confusion. My approach for clarification provides clear evidence that confusion over standards was a major contributor to the prisoner abuse. We owe our soldiers better than this. Give them a clear standard that is in accordance with the bedrock principles of our nation. Some do not see the need for this work. Some argue that since our actions are not as horrifying as Al Qaeda's, we should not be concerned. When did Al Qaeda become any type of standard by which we measure the morality of the United States? We are America, and our actions should be held to a higher standard, the ideals expressed in documents such as the Declaration of Independence and the Constitution. Others argue that clear standards will limit the President's ability to wage the War on Terror. Since clear standards only limit interrogation techniques, it is reasonable for me to assume that supporters of this argument desire to use coercion to acquire information from detainees. This is morally inconsistent with the Constitution and justice in war. It is unacceptable. Both of these arguments stem from the larger question, the most important question that this generation will answer. Do we sacrifice our ideals in order to preserve security? Terrorism inspires fear and suppresses ideals like freedom and individual rights. Overcoming the fear posed by terrorist threats is a tremendous test of our courage. Will we confront danger and adversity in order to preserve our ideals, or will our courage and commitment to individual rights wither at the prospect of sacrifice? My response is simple. If we abandon our ideals in the face of adversity and aggression, then those ideals were never really in our possession. I would rather die fighting than give up even the smallest part of the idea that is "America." Once again, I strongly urge you to do justice to your men and women in uniform. Give them clear standards of conduct that reflect the ideals they risk their lives for.